Here’s my latest in the series of one bowl suppers that the Southern husband and I have been experimenting with over the last couple of months. Just as a reminder, the one bowl suppers combine a green veggie or two, a whole grain and some kind of protein along with a few garnishes in one bowl…all of which sounds very science-ish until you realized that this actually means shrimp, watercress, feta cheese, sugar snap peas, sliced apple and brown rice garnished with honey roasted peanuts and drizzled with yogurt ranch dressing. Oh yes. The only things that need to be cooked in this supper are the rice (and if you have leftover rice that will work just fine), the shrimp and the sugar snap peas, both of which can be cooked up in the same water just until they are both done and tender, about 3-4 minutes. The rest of this is just arranging it in a pretty way on the plate. 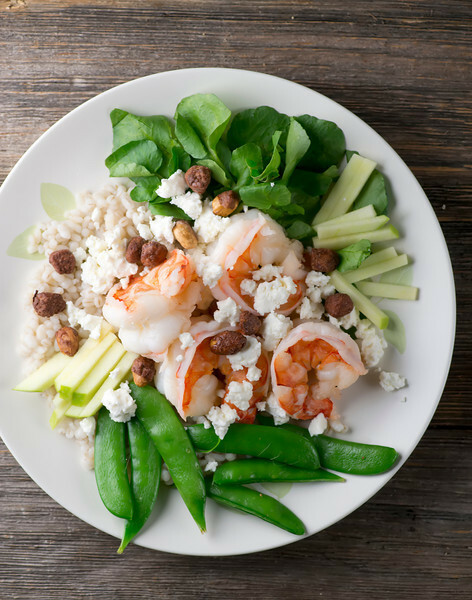 Rice, shrimp, sugar snaps nestled in with watercress leaves and thin slices of green apple. Scatter some crumbled feta cheese and honey roasted peanuts on top and drizzled on the teeniest bit of ranch dressing. It’s a scrumptious mixture of warm and cool, sweet and salty, good and good for you. We’re going to keep this one dish series going! Bring a medium size pot of water to a boil. Add shrimp and peas and cook for 3-4 minutes until both are done, about 3-4 minutes. Drain. 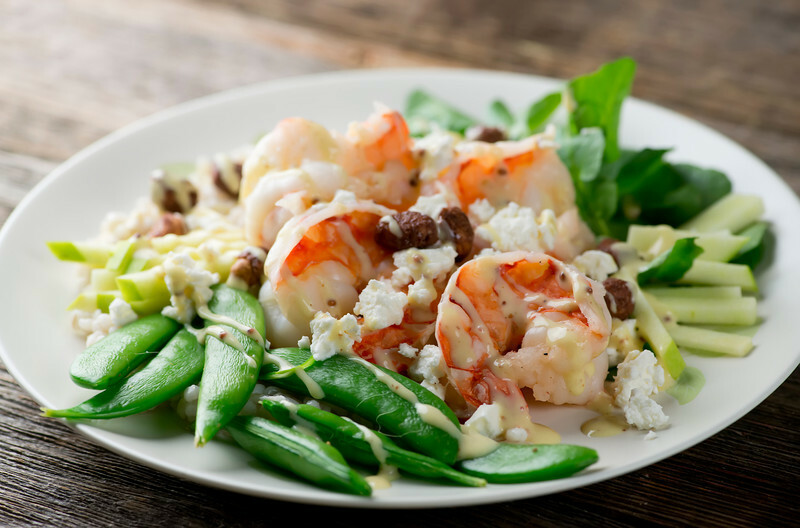 Arrange peas and shrimp on plates along with watercress and apples. Scatter cheese and peanuts on top. Drizzle with dressing and serve. I love this dish! I would probably fry the shrimps with some garlic and chili… This recipe sounds and looks delicious!